Earlier this week, the Drudge Report offered up an irresistible piece of conversation bait to politics watchers: the prospect of Condi Rice joining the Mitt Romney ticket. Though Rice has said “there is no way” she’d ever accept the post, endorsements are flooding in, particularly among Drudge’s audience. 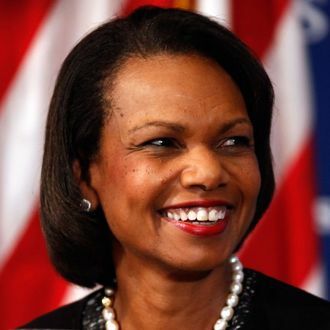 Of the 521,583 readers who responded to a poll, nearly 63 percent said they favor Rice as Romney’s VP pick. Obviously, that’s not exactly a scientific sample, but it does back up Intel Dan’s theory that Condi’s pro-choice views won’t prevent the right from embracing her.